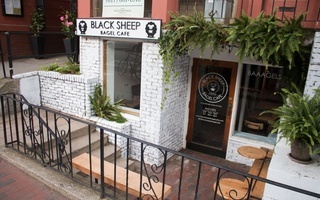 Black Sheep Bagel Cafe is tentatively set to open in the lower space of 56 JFK Street in Harvard Square around May, pending the outcome of a licensing commission hearing next week. 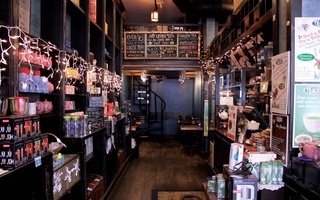 If approved, the eatery will join fellow building tenants Good Vibrations, Forty Winks, and the Boston Tea Stop. According to the proposal sent to the commission, the shop plans to be open everyday from 7:00 a.m. to 3:00 p.m.
Students are already expressing their excitement for the eatery that—according to Boston Eater—will serve over a dozen different types of bagels. “I definitely think there will be an interest for it,” Grace E. Geiger ‘20 said. For Geiger, a bagel place is just what Harvard Square needs, especially following the seizure of Market in the Square. “I feel like we’re missing that college town deli especially since Market closed,” she said. Sofia C. Shapiro ‘19 feels similarly. “I love bagels and lox. If they have that there, that would be really exciting for me,” Shapiro said. Hillel members also expressed excitement about the opening of Black Sheep. Hillel hosts monthly bagel brunches that are currently catered by a shop in Newton. “If this place were kosher, that would be super helpful to us. Right now we have to go outside the square to get bagels,” said Rebecca Powell, the student activities director at Harvard Hillel. Despite the buzz, however, some students said the success of the cafe will depend on its affordability. 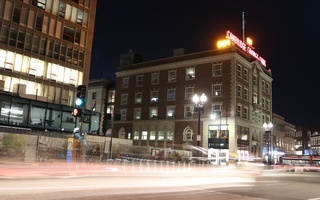 Denise A. Jillson, the Harvard Square Business Association’s executive director, noted that Black Sheep’s opening would come amid a recent spate of new bistros arriving in the square, including Blue Bottle and Pokeworks.